'Best' is always a big claim and Design daily is generally reluctant to use it. In this instance it is to replace a far more convoluted description such as 'most interesting production pieces' So for the sake of brevity I have acquiesced. The following products are not intended to be a definitive list as despite every effort to see as much as possible over a 10 day period I have to admit that there are probably dozens of items that should appear in this round up that were unfortunately missed. Rather than writing about every designer and brand featured in this post I have decided only to include captions and in a number of occasions links to company websites. The rest, dear reader, is up to you to discover through the wonders of the world wide web. Enjoy. Ferruccio Laviani's 'Gothik-A' cabinet for Fratelli Boffi - amazing sinuous woodwork wrapped around a glass box. One can't help but be amazed by the technical dexterity of it all - even if its not your thing. 2017 was the year of the cabinet - there seemed to be an avalanche of fabulous concepts from the extremely delicate to the Brutalist. The extensive use of pattern, texture and colour was also very much in evidence. 'Shade' sideboard by Giuseppe Vigano for Bonaldo. The green lacquered surface has a fine rectangular pattern running through it in what the marketing material describes as 70's inspired graphics. The overall effect is like computer punch cards. 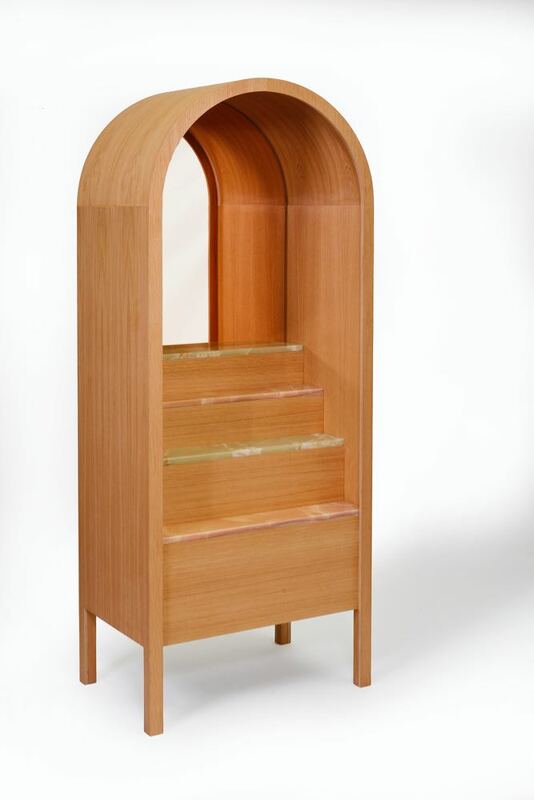 Baxter's 'Guell' bar cabinet by Pietro Russo. The cabinet's fluted exterior has a smooth pale interior with brass bottle racks. Driade's 'Ziggurat' cabinet by DriadeLab. The seemingly adhoc geometric pattern wrapped around the form is full of energy. Elena Salmistraro's 'Polifemo' cabinet (2013) shown as part of De Castello's Tracing Identity exhibition curated by Evelina Bazzo with work by Alessandra Baldereschi, Nathalie Dewez, Constance Gusset and Nika Zupanc. Photo: Massimo Gardone. Gallotti & Radice 'Athus' cabinet by Oscar & Gabriele Buratti - strong and architectural with beautiful detailing. The 'Basso' cabinet by Gustavo Martini for Brazilian company AuCap. The cabinet also comes as a low sideboard. In both cases the interior is in a contrasting pale timber. 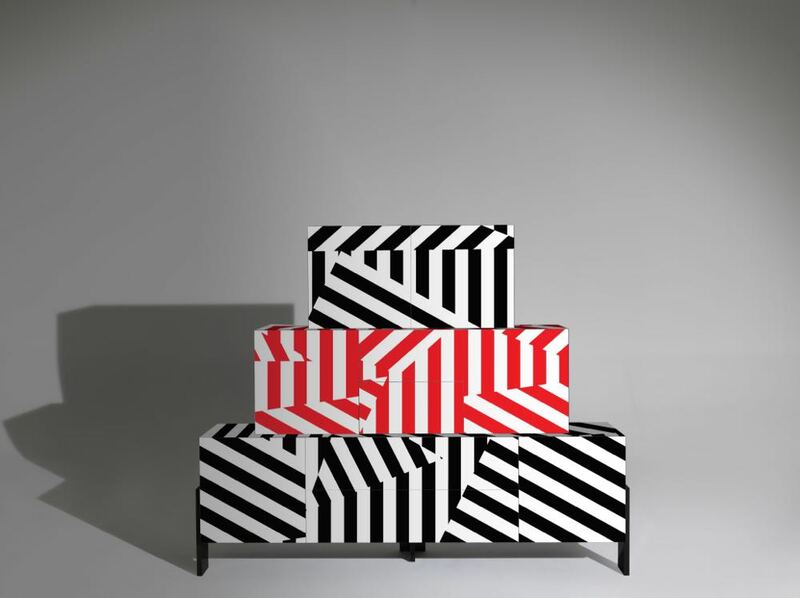 'Grek Box' by Oscar & Gabriele Buratti for Living Divani. The Buratti brothers were everywhere this year: Porro, Living Divani, Galeotti & Radice and Gebruder Thonet Vienna. The 'Elizabeth' cabinet in corrugated copper by Nathalie Dewez for De Castelli - part of the Tracing Identity exhibition. Fine triangular folds create a sense of rhythm & precision. Available in copper, brass or stainless steel. Photo: Massimo Gardone. Before cabinet overload sets in, lets look at a few lighting designs that stole the show at Euroluce and other locations around the city. An overhead view of Lucie Koldova's new 'Macaron' lamp emphasising the qualities of the wonderful translucent stone layer. Lucie Koldova's 'Macaron' marble and glass table/floor light for Brokis. 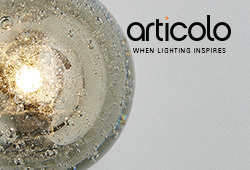 Giopato & Coombes 'Cirque' shown as part of an extensive new collection featuring the luxurious use of glass and brass. 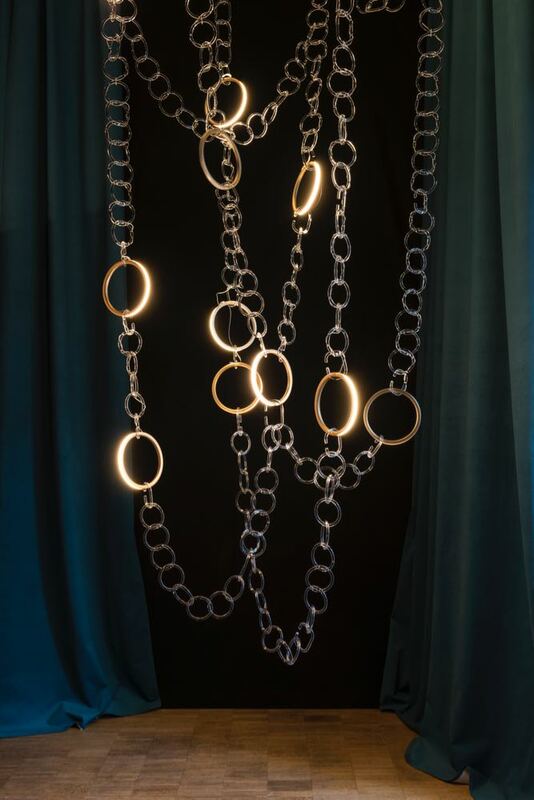 This amazing chandelier is by Federico Peri for Nilufar Gallery. 'Shapes' is available in all manner of configurations and features crafted leather details and handmade everything. 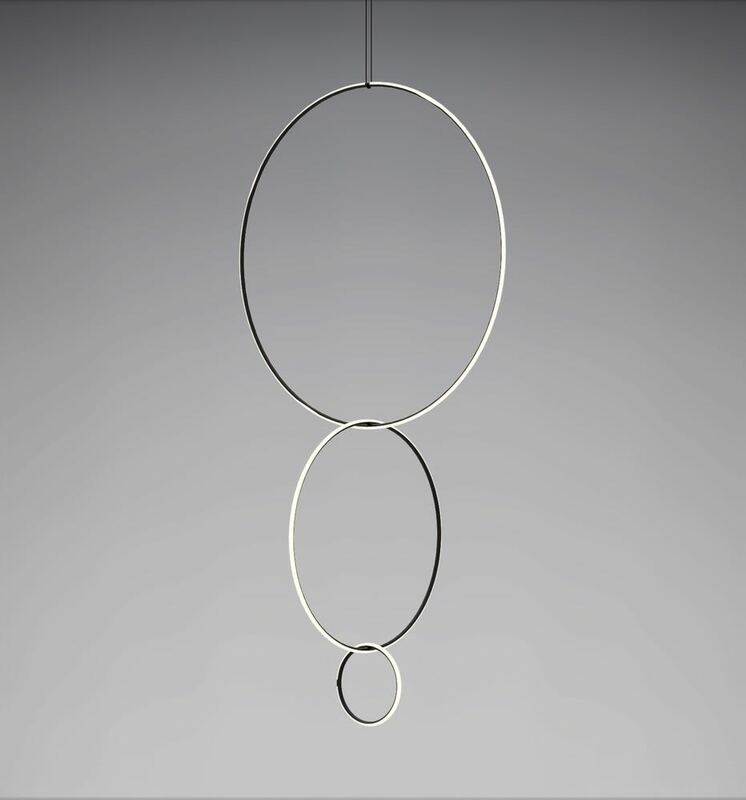 'Fontana Amorosa' by Michael Anastassiades for NIlufar Gallery. Jus tone version of a while collection of 'weeping' lights in Bauhaus red by Anastassiades. The designer also presented new work for Flos and for his eponymous brand at Euroluce. 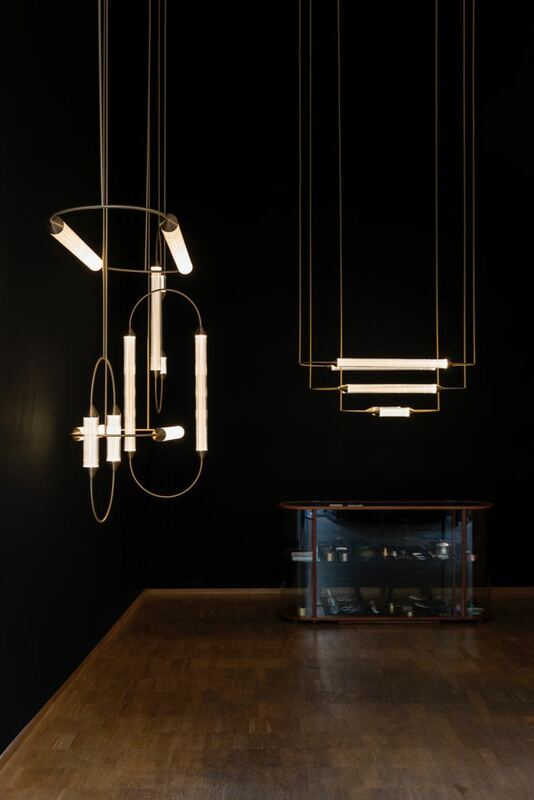 UK lighting designer Michael Anastassiades may be more well known for his elegant use of metal rods but he also tried his hand at creating lighting using the wonderful spray on material introduced to lighting by George Nelson in the 50's. This follows other Flos designers: Achille and Pier Giacomo Castiglioni's 'Taraxacum' and 'Viscontea' pendants in 1960, Tobia Scarpa's 'Fantasma' floor lamp in 1961 and Marcel Wanders' 'Zeppelin' pendant in 2005 and 'Chrysalis' floor lamp in 2011. In a similar style but a completely different material, Ingo Maurer introduced new designs from his MaMo Nouchies collection first launched over a decade ago. Unlike the rubbery spray on material used by Anastassiades for Flos, Maurer's Momo Nouchies lights are constructed from pleated paper. Renown German lighting designer Ingo Maurer released new additions to his Mamo Nouchies collection including the 'Yoruba Rose' table lamp shown above. The lamp is made from pleated paper. 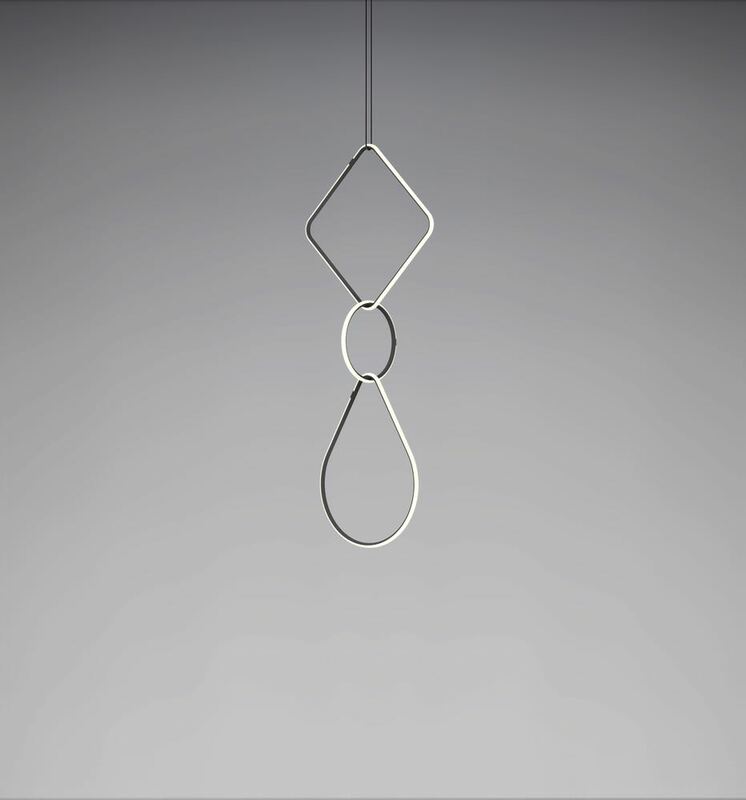 More beauty from Anastassiades but more in his typical style, the Arrangements collection of interconnecting loops was also designed for Flos. LED is allowing every designer to play with shapes that had previously been impossible no longer do they need to disguise the bulb. Dutch designers Their & van Daalen embrace the LED strip inside a perspex rod as a way to support their flexible textile 'shade'. Dutch studio Their & van Daalen presented their 'Vapour' light at Ventura Lambrate. The mesh outer sleeve of the LED lit acrylic cylinder can be manipulated by the user and the light can be used horizontally or vertically. In white or black. The floor light below left is the 'Nomade' lamp by Alessio Bassan for Roche Bobois. the wall light below right is called 'Nota' by Elisa Ossino for De Padova (in both the arms rotate) Ossino's design is also available as a floor light. The 'Harry H' pendant by Carlotta de Bevilacqua for Artemide combines LED and OLED technologies in the one lamp. The rectangular flaps are the OLEDs and the angle of these can be adjusted. The light below left is the 'Eos' by Bernhardt & Vella for Artemide. Below right is the 'Cipher' pendant by US designers Yabu Pushelberg for Czech lighting company Lasvit. In a similar vein as the Yabu Pushelberg light are a number of pieced for Flos by Konstantin Grcic and Ronan & Erwan Bouroullec. 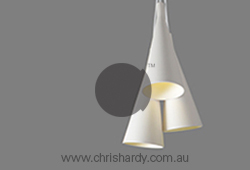 Intensely vertical, these pieces offer something completely different than the usual pendant and floor light. The 'Nocta' collection by Grcic is composed of several floor table and pendant variations that utilise modular comments that can be joined to add height. 'Kanji' table lamps by Denis Guidone for Fontana Arte. Made from glass the lights are also available as pendants. Neri & Hu's 'Yanzi' lights for Artemide - delicate perches for imaginary birds. Below left is the 'Heliacal' floor lamp by OS&OOS for Fontana Arte. Previously shown at Rossana Orlandi as a prototype, the wonderful 'Heliacal' lamp is inspired by astronomical phenomena in the rising of the sun and moon. 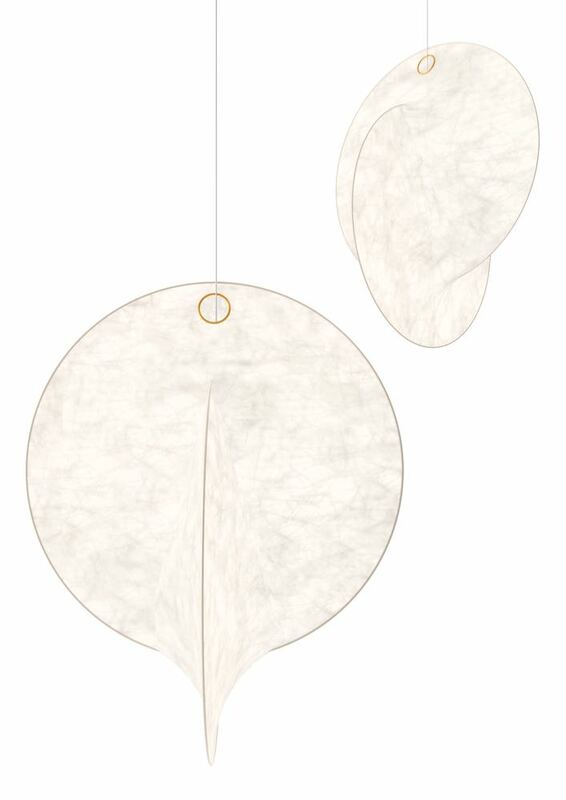 On the right is Umut Yamac's new floor light 'Bloom' that is made from folded paper and brass. Yamac has previously released lights with Moooi made from folded paper that resembled birds perched on a wire. Nendo's 'Gaku' lights for Flos allow the user to create wonderful little vignettes within a graphic frame. Using magnets the lights can be positioned anywhere within and on top of the frame like small three-dimensional artworks. From the AuCap collection, the 'Pablina' tables are by Leo Di Caprio (no not the actor Leonardo Di Caprio). The use of exotic stone in design has erupted - pun intended as this has brought about not only an interest in onyx and unusual marbles but also in Lava Stone. The Italian studio CRTLZAK premiered their 'Antivol' lava stone side tables shown below left and marble specialist Citco amazed with their ability to cut the most complex of shapes from solid marble. Aria Levy's 'Mineral Structures' for Citco are shown below right. Lava stone was also being promoted by Danish - Italian ceramic specialist Made a Mano who showcased a range of their tiles and furniture pieces made from glazed lava stone at Palazzo Litta. Made a Mano also collaborated with New Zealand born Dutch based designer Sabine Marcelis at the Wallpaper* Holy Handmade show creating her massive lava stone block called 'Altar' shown below. Paola Navone's 'Matera' tables for Baxter in a black & white terrazzo known as 'Palladio Moro'. 'Altar' by Sabine Marcelis for the Wallpaper Holy Handmade exhibition. The largest possible block of solid lava stone placed on a glass box and glazed in a shade of indigo. Photograph by Johan King. 'Etnastone' table from Made a Mano. Interlocking glazed lava stone elements on a raw lava stone base. Tables from Made a Mano can be customised in sizes up to 160 cm for round tables and 360x150 cm for rectangles. Photo by Yves Callewaert. Aldo Bakker's 'Brown table' for Danish brand Karakter. The monolithic quality of this table is quite powerful yet calming. The Magis stand at Salone featuring the new 'Brut' sofa by Konstantin Grcic. You've got to love the beautiful casting. From the hardness of lava stone to the softness of a rug / wall hanging with fringes........This beautiful design by was seen at Masterly, the Dutch Design platform exhibited in Palazzo Turatti. Part of a show on Dutch products inspired by the De Stijl movement, this piece combined a variety of pile heights and textures along with the fringing. Like all good De Stijl pieces from the past, it's all about composition but the use of that shade of blue certainly helps. 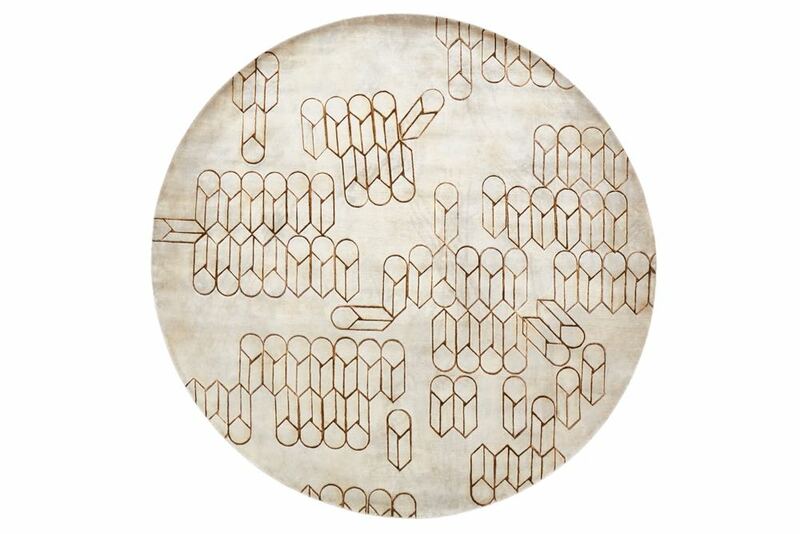 Dutch designer and company Nicolette Brunklaus specialises in woven textiles and rugs. This piece is part of a new acoustic wall hanging series. Photo by Arjan Benning. Rugs are something that is always exciting during Milan Design Week. Competition between brands like Nodus, cc-tapis and Golran runs hot as they seek out the world's most interesting designers to create limited edition and production rugs. Shown below left is 'Colour Stamp (Pillole)' by Florian Hauswirth and on the right is the religious motif inspired 'Cangaco' by the Campana Brothers - both are from Nodus. Other designers this year included Maarten Baas, Constance Guisset and Nendo. 'Brand mark' by Florian Hauswirth from Nodus. The design is not woven in but branded into the wool. Nendo, in his inimitable fashion has produced a rug collection that not so much offers different interpretations on the one rug concept as much as three stages of producing the same rug (does that mean he gets paid three times for designing the one rug)? Anyhow, its a lovely concept where the rug can be bought in what appears to be various stages of completion. The final completed stage feels quite traditional while the other two feel suspended as if the maker had gone out to the shops to buy milk. Others might describe it as an interesting play on positive and negative space. While cc-tapis has become quite famous for its bright geometric rug styles by the likes of Patricia Urquiola and Alex Proba of late they have always maintained a quieter side that deals with natural colours and textural elements provided by different yarns and by a variety of pile styles and lengths. These rugs such as the 'Quadro Celeste' rug range by Studio Pepe and Chiara Andreatti 's 'Primitive' range, don't get as much press coverage but are probably an easier style to live with long-term. Adding to this side of cc-tapis' collection is a new series of rugs by Faye Toogood - two of which, 'Patch' and 'Rope' can be seen below. The 'Garden Layers' rug collection by Patricia Urquiola for Spanish label GAN. Living on the floor has never been more appealing. The combination of colour, texture and softness offers the antidote to our western obsession for sofas. Every year there are a certain number of reissues of important past designs. This year it was time to recognise he overwhelming talent of Angelo Mangiarotti. Gio Ponti and Gino Sarfatti have been a big draw card for several years and companies seem to uncover another one or two of their designs each year. 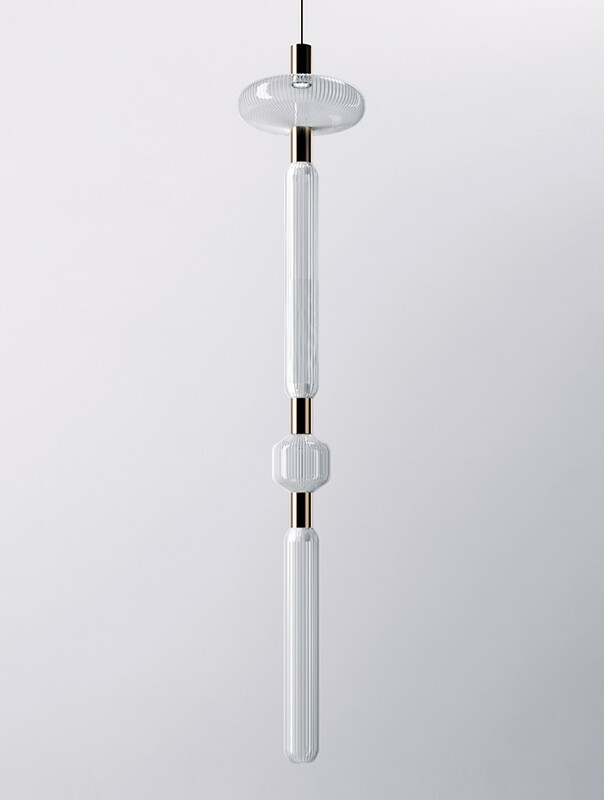 Molteni has been reissuing Ponti thick and fast in recent years but Milanese brand Tato has got into the act and reissued the sublime 'Luna' glass floor lamp that resembles a glass version of Isamu Noguchi's famous 9A paper lamp. 'Luna' lamp by Gio Ponti - reissued by Tato. Glass and brass in the style of Isamu Noguchi's 9A lamp in paper and bamboo. Other Ponti reissues include the marvellous D156.3 chair from Molten & C. The wooden frame has an upholstered pad that flows from the back to the seat over wide elasticated straps. Molteni also reissued the D151.4 chair which can be seen here. Danish label Karakter reissued two Mangiarotti gems - the 'Aida' from 1988 below left & 'Lari' from 1978 below right. 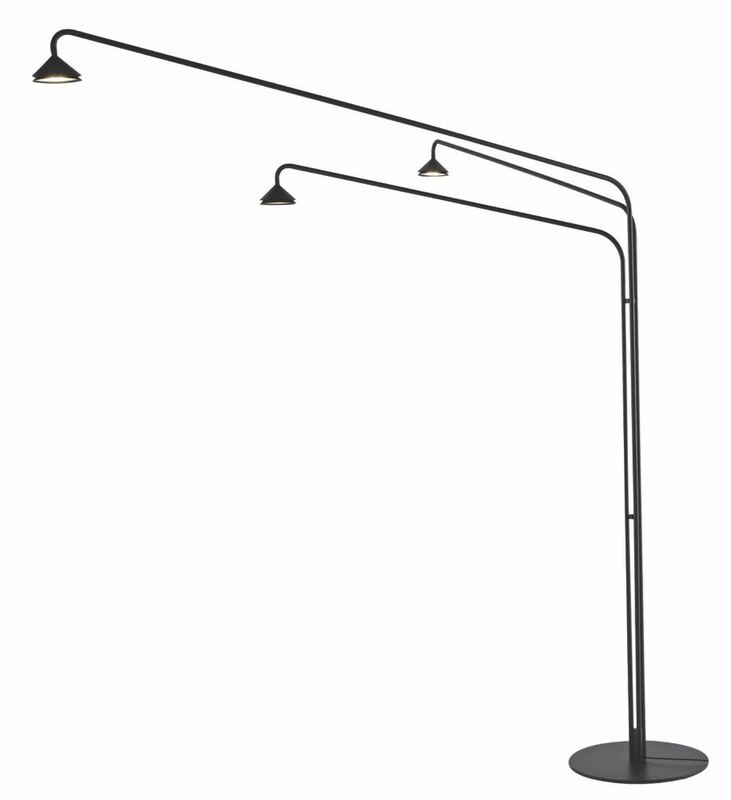 The E63 table lamp by Umberto Riva was reissued by Tacchini. The table/desk light from 1963 gets lovely new colours as part of its reissue. Another important reissue courtesy of Tacchini is the 'Oliver' sofa by Gianfranco Fratelli from 1957. The upright sofa has much of the same attributes as a Florence Knoll sofa from the same period but incorporates a beautiful metal leg detail where the open legs are filled with timber near the foot. The chair below is called the 'Leggia Hydro' and is from Baxter. While its not a reissue it definitely has the feel of a classic mid-century sling chair - part Charles Pollock chair, part Hardoy Butterfly chair. Those who love the colour known as 'blush' were treated to an endless variety of examples as designers incorporated it in installations, products, photography and just about everything imaginable. In addition there was a lot of burgundy and Bauhaus red (see Apparatus studio below and Michael Anastassiades' lighting for Nilufar). Apparatus Studio's new translucent resin tables with richly coloured lacquered tops at their showroom space at 5Vie. Konstantin Grcic's sofa system 'Soft Props' for Cassina - inspired by handrails found in the Milan metro. Pushing blush in the direct of coral the combination with the hard black handrails is very striking. Cc-tapis also released a beautiful new rug collection by the super talented Dutch textile designer, Mae Engelgeer, that combine pattern and subtle colour in a highly sophisticated way. She has been a regular standout in new textile design over the last decade. If you haven't checked out her work you definitely should. Zanotta released a new bed called 'Hotel lRoyal' that provided a wonderfully austere bed with just a few tight button details and decidedly petite head and foot boards in linen. Advertising photography then dressed this up in a sea of blush - not all that successfully in my view. Simplicity verging on austerity and pink just don't seem to go together no matter how soft that pink is. Zanotta's 'Hotel lRoyal' bed pictured with their new 'Judy' chair by Frank Rettenbacher and 'Taschino' bedside table by Gabriele Rosa. Just so so you don't think the chair page is missing......here are a few of the chairs that embodied the trend for bulky, rounded forms - many of which had either overtly fine legs or no legs at all with a seat that went right to the floor. 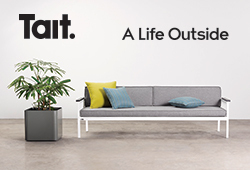 The modular sofa range below is the 'Okome' by for Alias. The 'Okome' range from Alias offers a block colour concept in soft rounded shapes. The trend for overstuffed simple forms continues and this year saw an array of the large and heavily padded.The chair below is the 'You' by Luca Nichetto for French label Coedition. B-Line's 'Overpass' chair by Favaretto & Partners (from 2016) has just grown into a lovely little two seater. While some chairs didn't conform to the chunky and round still exuded that overstuffed men's club feel. The 'Adda' chair by Antonio Citterio for Flexform is a prime example. The 'Pala' chair by Luca NIchetto for Artifort. The 'Highline' sofa by Sebastian Herkner for Linteloo. An ultra-thin back is swathed in luxurious velvet pillows. The chair on the left is the latest design for Porro by Gam Fratesi called Kite. ON the right is 'Roma' by Jonas Wagell for Tacchini. Both have vintage connotations but are deeper than most 50's designs and highly comfortable. Hayman Editions' new 'Franck' armchair by Charles Kalpakian presents an extremely different look to most other designs launched during Milan Design Week. Strangely conservative and yet quite directional at the same time.....How is this possible? All that's left to show are a few oddities that Design daily found particularly appealing / interesting. Sometimes there aren't reasons why an object is appealing - it just resonates with you and this handful of objects are a few of the ones that did. Roderik Voss' 'Ishi' table and chairs for Dutch brand Linteloo feature cigar shaped legs and a dominant base design that lets the table top and chair seat float. Slightly Hansel and Gretel but interesting. Woven cane is big and the bentwood specialist Gerbrüder Thonet Vienna has embraced it releasing several new designs that feature the material including the N.O. chair by Front (left) and a small range of lights by Italian brand Servomuto. 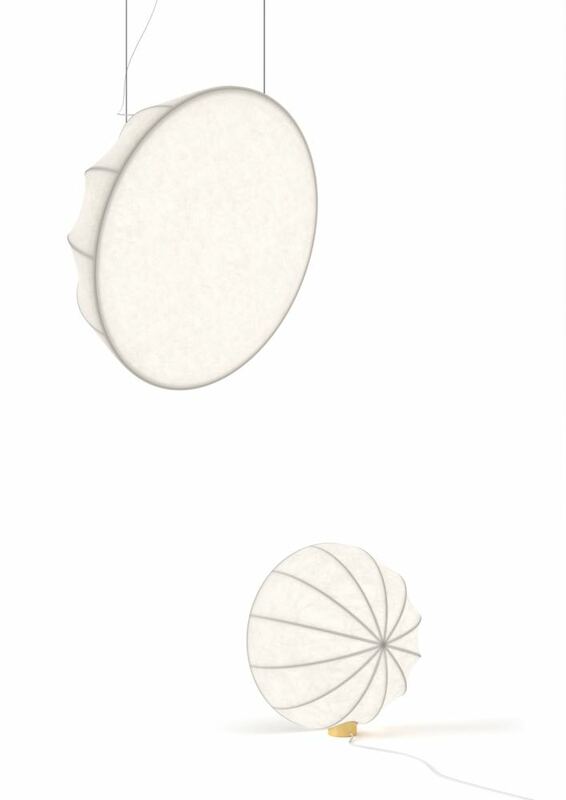 From Nendo's dissolving table series called 'Flow' for Alias . Each low table ends in what can only be described as a bucket made from polyurethane. Nendo's never-ending library of visual puns is quite extraordinary. The 'Remo' chair from Cizeta Sedia. The slightly strange flared legs set at 45 degrees appeal somehow.